We all know that having a baby isn't cheep. That's why my husband and I waited as long as we did to add a third person to our family. We wanted to make sure that we could provide our child with everything that we wanted to. It takes a lot of planning and preparing financially before you can take on the responsibilities of parenthood. Once that little baby arrives your budget is definitely going to go up with all the added expense. In the nine months before your little one arrives, you should be spending your time finding ways to save yourself money, instead of spending it. 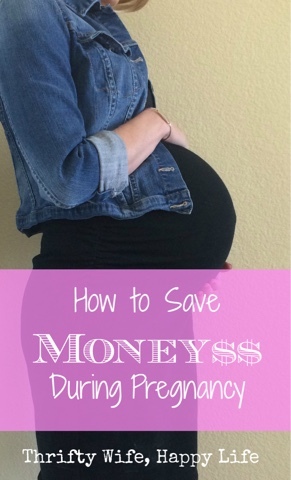 I've decided to share a few things that I have been able to save on money during my pregnancy. Pregnancy Test- I might as well start at the beginning of trying to have a baby. If you have ever tried to conceive a baby, you know how important those 2 little lines are on a pregnancy test. If you're anything like me, you won't believe the first one, so you will want to take another one just to be sure. Spending $20 on a pregnancy test is the last thing you want to do. This is why I love the Dollar Tree pregnancy tests. They're only $1 per test, so you can stock up as much as you like and you still won't spend as much as you would on an off brand test from the drug store. One time I spent $10 on one Walgreen's brand pregnancy test. After that, I told myself I would never make that mistake again. Just remember, when you're pregnant, you're pregnant. You don't need the most expensive test to tell you that. Insurance Plan- Pregnancy is filled with doctors appointments. All in a sudden you go from a healthy person who goes to the doctors once a year for a annual physical, to going every month, to every week towards the end. One of the first things you should do after finding out you're pregnant is to look into your insurance health plan. Find out what is covered during pregnancy and what is not. In my first trimester it was open enrollment for insurance at my job. My husband and I were able to compare our insurance plans and I was able to switch to a better insurance plan through my company that offered a lower deductible. Since we knew I'd have more expensive medical bills this year, it was worth it to pay a little extra each month to help in the long run with all the expensive. Breast Pumps- Whatever you do, do not buy or register for a breast pump. With the new Affordable Care Act, most insurance companies will cover 100% of a breast pump. I didn't realize this at first. I had heard that you could get a breast pump covered, but I didn't realize how easy it was. I thought that the insurance company would make you jump through hoops. That was not the case at all. I simply called the insurance company and asked if it was covered. They then told me it was and what company I could go through. My insurance used a company called Yummy Mummy. I went to the website, picked the breast pump that I wanted, filled out the information, the company contacted my doctor for the prescription and then they mailed it to me. I now have a $200 breast pump for free. Prenatal Vitamins- Prenatal vitamins are important for your baby's development during pregnancy. I found out pretty quickly that these vitamins are not always cheep. The first doctor I went to in Las Vegas told me that I needed to take the best and most expensive brand of prenatal vitamin. She made it sound like I'd miscarry if I didn't take them. I went to fill the prescription and the pharmacy called me just to confirm with me that I wanted to spend the $200 on the month supply of vitamins that my insurance didn't cover. Of course I ended up cancelling that. I ended up switching to a different doctor, who told me that whatever the over the counter brand I was taking should have everything that I need. I just decided to stick with the Target brand that I was taking before I got pregnant. When I was living in Michigan, my doctor was able to write me a prescription for some prenatal vitamins that were completely free. I suggest talking with your doctor and checking to see if they can help you out at all with the price of vitamins. Don't always listen to them if they are trying to push an expensive brand on you that you can't afford. Baby Freebies- There is nothing better than free, that's why recently, I've been researching and signing up for any site I can that will mail me free samples. I've signed up for a few baby product websites like Everyday Family, Pampers, Similac Strong Moms and Enfamial Formula. So far I've received 2 formula samples in the mail, which were pretty decent size samples. Even though I plan to breastfeed, I'm not against using formula to supplement feedings when needed. I'm still a little worried about breastfeeding and pumping when I go back to work, so that's why I'm happy to have some formula on hand if needed. I have also received tons of coupons from sites like Shutterfly and Tinyprints. When I made my registry for my baby shower, both Target and Babies R Us gave me a bag of samples and coupons (here). Motherhood Maternity gave me coupons for free nursing covers, car seat covers and baby slings. These are great if you're willing to pay the shipping price, but as of right now I'm looking for completely free with no shipping fees. You would be surprised with how many companies are willing to ship you free samples to test out. I'm still looking for more freebies so if you know of any other good places for freebies please leave a suggestions below. Maternity Clothes- I feel like I've been talking about maternity clothes for most of my pregnancy on this blog. I've tried to stay away from buying actual maternity clothes altogether. Maternity clothes are more expensive than normal clothes and for the amount of time you actually get to wear them, it just doesn't seem worth it. I was able to get away with wearing all my normal clothes for all 9 months. Luckily, I only gained weight in my belly. Everyone is different though and every pregnancy is different. So my best advice if you're going to invest in maternity clothes is to hold off until you actually need them. When it comes time to invest in a few key maternity pieces, look into some inexpensive ways of buying them. Check to see if any thrift stores have some cute things, Target has a great maternity selection and you can find some good clearance deals, also Old Navy has some cute stuff. In my experience, I found it easier to buy maternity clothes online. There is a better selection and it's easy to price compare. If you do out grow all your clothes and need to buy a lot of maternity clothes, I wouldn't go crazy with buying too much. Try to stick with simple everyday pieces like tank tops, t-shirts, a pair of jeans, leggings and maybe a dress. Then you can just accessorize them with sweaters and long open cardigans that you may already have in your closet. Create a Baby Registry- It is so tempting to want to buy things for your baby when you're pregnant, but don't. Create a registry first with all your baby needs and wants. Weather you have a baby shower or not, people are going to want to buy your new baby things, so having a registry will help them know what you want for your little one. I went ahead and put everything on my registry including the big items, because you never know what people will be willing to buy you. Once you get closer to your due date you can go back to the stores that you registered at and purchase the things that you still need. Plus most stores give you a discount on all your registry purchases. Once you have everything, be prepared to reuse it all with the second or third baby. This is why I stuck to pretty natural colors. There's no need to purchase everything new for the next child. Also be practical with your registry. Only register for the items that you know you will use. Don't waste your money on the gimmicky baby gear. No wipe warmers and diaper genies for me. Those are just a few ways that I have saved money to prepare for my baby's arrival. I'm a first time mom, so I'm still learning the tricks. I'm excited to find some other ways to save money after the baby is born. Please, if you have any suggestions on where or how to save money, leave a comment below. I'd love to get some more ideas! Depending on the family’s needs, she can even stay longer than that, for example when the mom is single Secrets of youth and has no family to help her out or after a long, difficult birth. My husband and I got more hours because we have two other kids to care for and because we’re expats. Indian print cotton dresses are good for warmer climates - I love these because my mother used to wear them when she was pregnant with me. As she's binned them I got frustrated and bought some at.